Perhaps you just tied the knot, or you’re looking for something special and out of the box way to celebrate an upcoming anniversary. Tattoos are a wonderful way to commemorate any special event, but finding one that’s just right for you and your spouse is sometimes challenging. 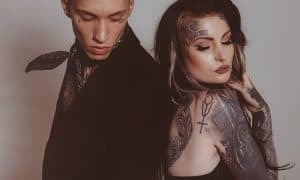 Here’s a list of unique tattoos you can get with your partner to celebrate! It’s easy enough to conceal a small tattoo that bears your anniversary date on it. You can go stylistic and use Roman numerals, tally marks, or simply do Arabic numerals. These can go just about anywhere, from on your fingers, to behind the neck, on the wrist, or even on the side of the hand as a nearby reminder of the one you love. Are you in love with the metal bands bonding you with your spouse? Get matching tattoos depicting your rings linked together, or perhaps tattoo a small band around your ring finger. The linked rings could be an adorable rib cage or collarbone nod to your love for your spouse, perfect if you want to match them. Have you considered the skyline of where you met your love? Or perhaps, the wedding venue had a beautiful piece of scenery you truly enjoyed. A simple line tattoo is a beautiful testament to any location significant to the both of you. This selection has a diverse selection that allows you to go as bold or subtle as you desire. You can go for the obvious and simply get each other’s tattoos anywhere from right above each other’s hearts, on the ribcage, or even on the wrist. If something more subtle and potentially even more beautiful than simple tattoos, select something like flowers that have matching initials. For example, the initials RMS could be matched with the flowers rose, marigold, and sunflower for a bright, vibrant salute to your marriage. We at Skin Factory would love to help you and the love of your life commemorate your milestones! Contact us to ask about getting your tattoos today.